I LOVE packaging. Stamps, tape, envelopes, stationary. All of it. One of my favorite things about etsy is the time and care people put into sending your purchase. Lately I’ve been noticing a store trend that kind of irks me. Buying simple items in bulk, tying a cute ribbon or twine around a handful and selling 20 at the cost of 1,000. While I won’t name names. I did want to share some wholesale and reasonably priced options for some of your favorite little packaging supplies. 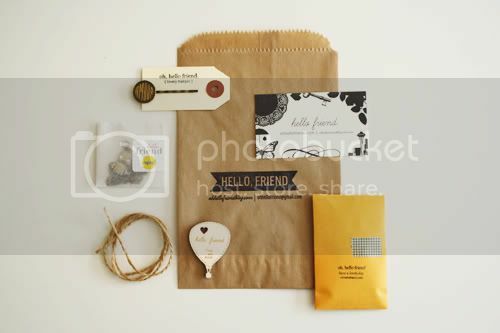 Photograph of Oh, Hello Friend‘s amazing packaging for her beautiful jewelry. It’s not fair to do that or even really creative but one walk down a “craft” store lane will tell you that some people will pay for convenience, and others are more than happy to charge you for it. i love packaging too! especially anything with brown paper…what is it about brown paper? Oo, thanks for the tips! I too am a packaging fanatic.